Years ago when we purchased our first hurdy gurdy, a big part of our decision was based on our limited budget. As a result we ended up with an instrument that was pretty much unplayable. That early experience led us to begin building them ourselves. The first HG we made was to replace the one we purchased. Immediately after we began incorporating our new Hurdy Gurdy into our live performances, people started asking 'Can you make me one just like yours?' That's how it started for us. We didn't advertise, it was all word of mouth. After many proto-types and years of playtesting our models at live performances, we are very pleased to be able to offer full featured, great sounding hurdy gurdies to fit any player's budget & needs. Our goal is to not only offer the best hurdy gurdy for the price, but the best hurdy gurdy at any price. As you might have guessed, we are very passionate about Hurdy Gurdies and want to share them with the whole world. WHEN YOU ORDER FROM US... you are ordering from a professional, full time hurdy gurdy shop. Every single workday is spent refining and expanding the craft of hurdy gurdy making. With over 1,300 instruments built, you are getting years of playtesting and building experience in each instrument. We know how much fun it is play a Hurdy Gurdy, and we can't wait to share them with you. George was a business student in college (UNR in Nevada). He was going to be an accountant, but we all know how hard it is to find work in that field. So, he took the easy way out and became a musician & luthier instead. George started making dulcimers & harps way back in 1994. In the late 1990's, George got his first taste of making hurdy gurdies and found his true musical love in these wild and wonderful instruments. Anwyn started this all with George back at the beginning. Besides her work with instruments, Anwyn plays hurdy gurdy, psaltery, hammered dulcimer, & guitar. We perform 'pirate' music under the name 'Long Blond Silver'. You can catch our shows around southern Oregon / northern California. 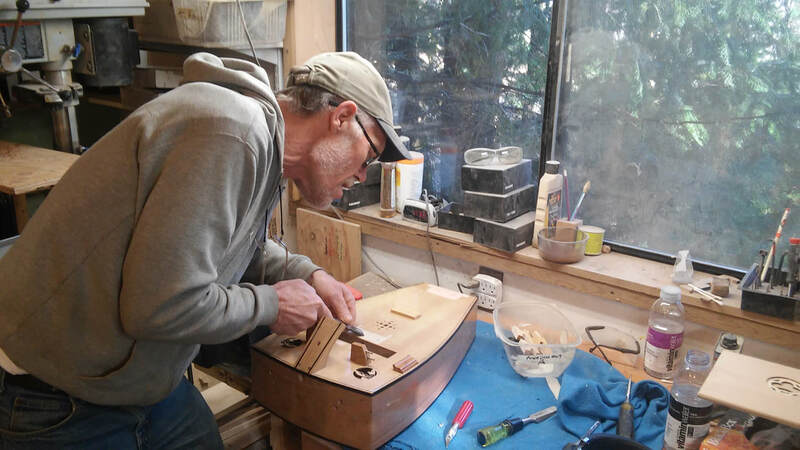 As a luthier apprentice, Earl joins us with years of experience as a hurdy gurdy player! His enthusiasm and love for all aspects of the instrument is a perfect match for our craft. When not in the woodshop, you can also find him performing under the name 'Earl the Bard', singing and playing his hurdy gurdy throughout the west coast. Bruce is a talented, all around craftsman going way back, and his perpetual 'zen' attitude is perfectly suited in transforming wood into singing works of art. For two decades, Gordon & Jean were the main propmakers & set designers for the Colorado Opera Company. They bring their vast skillset to benefit the hurdy gurdy community!